Rubber Room Ramblings: NANCY'S SHOEBOX FOR HALE! 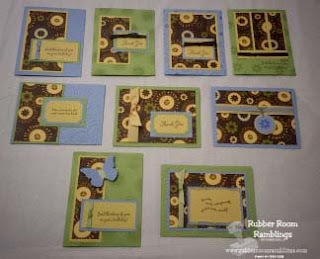 These are the cards I made with Nancy's shoebox swap! She did a one-sheet wonder that made 9 cards. I haven't done a one-sheet wonder in a long time, so this was a treat. I adore the diamond cut-out in the top of the box. 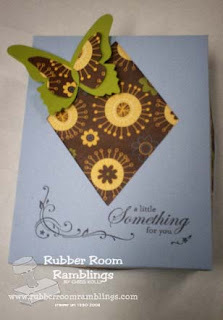 I was having a "thing" with my butterfly Big Shot die, so I had to add that to the top of my box too!